With St. Patrick’s Day around the corner, let’s make it easy by celebrating with green foods. 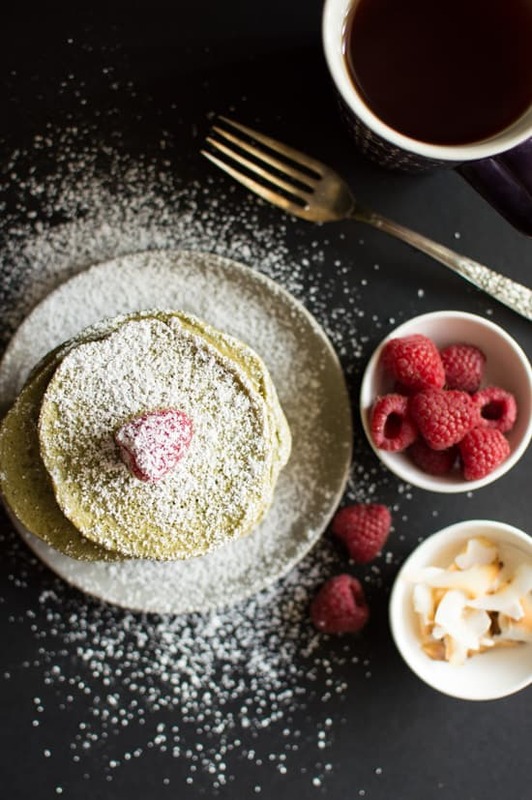 Add a splash of color to your breakfast by whipping up a batch of these green tea pancakes. They’re fluffy, vegan, and gluten-free! As a kid, I don’t remember anyone teaching me the actual origins of St. Patrick’s Day. All I knew was that it coincided with a deluge of arts and crafts revolving around four-leaf clovers, leprechauns, pots of gold at the end of the rainbow, and so much green. Oh, and how can I forget about the pinching? For the longest time, I thought the day was one big excuse for children to hurt each other. I will have you know that I was never that cruel! Miss goodie two shoes right here. I’ll be the first to admit I never got on top of St. Patrick’s Day. I almost always forget to wear green, and I have all the scars on my arm to prove it. (I don’t really, but let’s pretend for dramatic effect.) Sometimes, I luck out by accidentally grabbing my green headband to the gym that day. In other years, I’ve tried to get away with wearing a shirt that had a tiny speck of green on it. Wouldn’t it be easier if we could just celebrate St. Patrick’s Day with food? Let’s make it happen. I’ve been struck by the green tea matcha bug. Just a little bit of matcha, and you’ll get baked yummies with a delightful color. See these green tea chocolate chip cookies and green tea cupcakes. Add some to your pancake batter, and you’ll make a dish that brings a smile to your face. Alright, maybe I can’t guarantee that they’ll actually make you smile, but I do hope so! Me? It depends. On any given morning, I would go the Just Feed Me route because I am huuungry when I wake up. If I’m shooting photos of pancakes, I’ll go with the Classic because I’m all about that pour shot. And you know what I mean when I say pour shot. But the Plain and Simple has been blowing my mind as of late. As someone how has a taste for all the lemon things, powdered sugar and a quick squeeze of lemon juice is the quick and dirty way to get my cravings sorted. Am I the last person in the world to hear know about this powdered sugar and lemon thing? If you haven’t tried it yet, it’s definitely worth giving a go. Makes about 12 to 15 small pancakes, about 8 to 10 medium pancakes. Prepare flax egg: In a small bowl, whisk together flax and water and set aside. Prepare “buttermilk”: In another bowl, whisk together soy milk and apple cider vinegar and set aside. I added vinegar to the milk to mimic buttermilk. If you’re not concerned about the buttermilk taste in your pancakes, just skip this step. In a medium bowl, mix the flour, sugar, baking powder, salt, and matcha powder together. Add in the canola oil, flax egg, and milk. The flax egg should be a gooey consistency, and the milk should have curdled a bit. Stir everything until well incorporated. Heat a large pan over medium-low heat. I like cooking my pancakes on low heat to prevent them from burning too quickly. Apply cooking spray onto the pan and pour the batter. My pancakes were about 4 to 5 inches in diameter. Cook until you see that the edges of the pancakes start to puff up, about 2 to 3 minutes. Flip over and cook for another 2 minutes. Serve with your favorite toppings. You can always make a large batch of this and freeze them for the rest of the week. Looking for more breakfast inspiration? I completely agree with you, Karla! You should definitely try using matcha with your baking some time. I bet you would come out with some delicious treats! 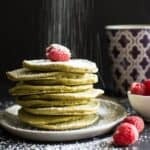 Pancakes any kind of way are my jam, but I have never tried vegan OR green tea pancakes! What a great idea! I think I spy breakfast. Pinned! Vegan pancakes are surprisingly good. Made them on our favorite tool–the Griddler! These look realy good, Lisa! Love the GIF, how clever! Thanks, Kelly! I couldn’t resist creating with with the powdered sugar! 1. I always forget StP day too! Luckily I have green eyes and can pull the lame “I’m always wearing green” excuse. 2. Love the powdered sugar GIF! So jealous. That looks beautiful! Hahaha, that is such a great excuse for wearing green! If only I could pull that one off too. These pancakes are seriously gorgeous! I’ve been having some serious pancake cravings, and these would be perfect to share with my vegan, tea-obsessed roommate. Yum! YES! This is right in your roommate’s wheelhouse! Gorgeous photos! You really know how to make a person want pancakes 😉 I’m usually the nut butter topping type but there’s nothing like classic maple syrup. YUM. Thanks, Alanna!! I just ate 4 of these pancakes with PB this morning. Soo good! Green tea in a pancake?? YES!! I would douse mine in whipped cream, maple syrup, and macerated strawberries. I guess that wouldn’t make it vegan anymore… whipped coconut cream to the rescue! Haha, yes! Coconut cream is amazing! Of course, regular whipped cream is fantastic too. We love pancakes in my house on the weekend! We have to try these-love the idea of the green tea! Pinning! Thanks, Julia! Let me know how it goes! I always love new recipes for matcha! I love your animated image – looks SO good!! These are beautiful! These look like light and fluffy pancake perfection! And that sugar snow GIF basically has me drooling. Thanks, Chelsea! It was so fun creating that! 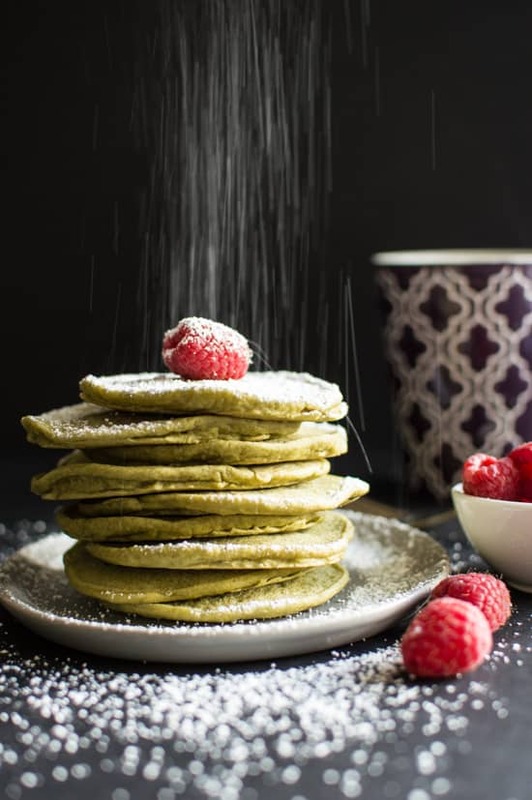 What a great idea to make matcha pancakes for St. Patty’s Day. The gif is awesome btw. It really showcases how fund pancakes can be. These look incredible! Great photos too. I am going to try this recipe asap. Thanks, Tedi! Let me know how it goes! These look divine! 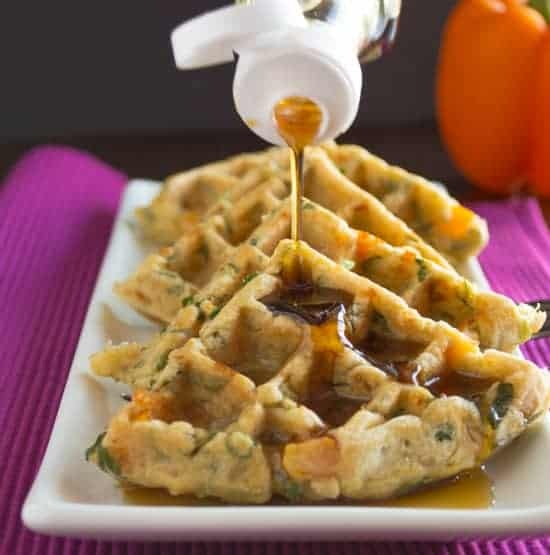 I want to try the veggie waffles too! I’m a combination of “classic with a twist” and “just feed me”- love adding peanut butter, maple syrup and fruit on top- yum! These are so cute and perfect for St. Patty’s Day! Oooh, yes, those two together would be great too! Thanks, Kelsey! Sarah, thank you soo much! I have so much more matcha to use. I definitely need to try your latte recipe and possibly make a few more cakes! Hi Claire, thanks for bringing this to my attention! The instructions should say baking powder as well. I have just corrected the instructions. Happy St. Patty’s day breakfast! I love using matcha in baking and everything else!! These pancakes look perfect!! 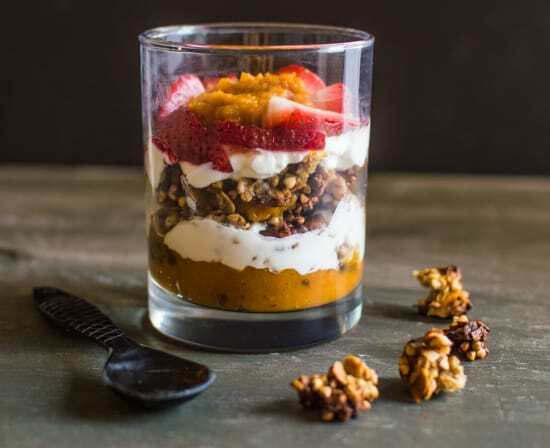 Hi, these look delicious and I’m looking forward to making them for breakfast this weekend. I was wondering if you could possibly sub soy milk for almond milk? Thank you! Absolutely, Georgia! Let me know how it goes! Thank you so much, Rakhee!! My dad eats low carb and we’re both vegan, so I’m wondering how I can incorporate coconut flour instead a normal gf flour? Coconut flour is very soft, so I wouldn’t use too much of it in this recipe, as the pancakes will probably crumble. You might consider a 50/50 or 40/60 blend of coconut to oat flour and see if that works. Hope this helps! my pancakes were pretty heavy and gummy… not sure what happened – maybe too much oil in this recipe? anyone else have this problem? Thanks for the comment. The gumminess might have to do with the brand of gluten-free flour you used. Bob’s Red Mill’s gf flour worked for me. Is that what you used, too? I might also rework this recipe so that you don’t have to rely on a particular brand’s gf flour blend for this recipe to work.